Walking in the countryside of Dorgali and Cala Gonone you can find small country churches, built during the 17th century: Nostra Signora de S'Ena, Nostra Signora degli Angeli, San Pantaleo, Madonna di Buoncammino, Madonna di Valverde, SanGiovanni Crisostomo, Spirito Santo, S. Giovanni Battista. A simple and basic architecture enhanced by the beauty of the surrounding landscape.Around the churches they were built cumbessias, the small houses used by the devoted and by the priors, who stayed there during the events dedicated to the holy religions. The traditonal religious Religious festivals were celebrated until the early 90s, attended by many devoted and always ending with good food. Among the eight churches, we recommend you a visit to the rural church of the "Madonna del Buoncammino", located in the valley of Oddoene. Built in 1668, has a nave of three bays, the turn of reeds and juniper beams. In the past the feast of San Pantaleo was celebrated on the last Sunday of May and the third Sunday of October, both preceded by the solemn novena. Today, thanks to voluntary associations and the Department of Culture of the town of Dorgali, the festival is celebrated on the last Saturday in May. In the afternoon devoted walk on procession from the parish church to attend the Holy Mass in San Pantaleo. A refreshment follows, with traditional music and choral singing. The church of Nostra Signora degli Angeli is located in the Cedrino Valley, on a large flat area here there are also numerous cumbessias (many unfortunately went destroyed). The festival is celebrated in early August, and during the celebration, the devoted offer meat wine and cheese, hung on sheets. The church is currently in fairly good condition and has within a block of marble with the following inscription "Plena perpetual indulgence granted July 16, 1806 by Pope Pius VII S.mo to all Christians who visit the church on Aug. 2 and all the eighth following each year and pray Our Lady of Angels. " This explains the reason for this festival to coincide with the first week of August. According to the Respuestas sent by the parish in 1778, the church of Nostra Signora di Valverde, was built between 1664 and 1665, thanks to the dowry of John Lai Marteddu and Antonia Cuca Soro: two small vineyards and four hectares. The church is modest with pitched roof and steeple front, the only entrance is flanked by two side benches outside and above this we find an octagonal window roughly made, which denotes the antiquity and simplicity of the system. The structure is supported by a spur on his left side and two on the opposite side, where there is a small chapel. The ancient cumbessias, of which some buildings still remain, have roofs made of reeds supported by beams, cobbled floor and stone seats. In the area we can also find a small chapel dedicated to Our Lady of Lourdes. In the past, the local celebration was scheduled for the first Sunday of May, preceded by a novena. Resumed a few years ago, it is part of the so-called "festas de pandela" and takes place on the Saturday before the first Sunday of May, with a procession from the parish of St. Catherine in the afternoon; then the Eucharist is celebrated and in the evening the organization provides refreshments and musical entertainment. The church can be reached from Dorgali, it is located 200 meters further than the rural church of San Giovanni Cristolu. The area is reacheble via a gate and a short wooded path. Further down the road you can get around Monte Ispinigoli and rejouin the path to the rural church of San Giovanni Su Anzu. The church of Su Babbu Mannu (Holy Spirit) is stylistically very similar to other rural churches of the territory. The property has two entrances, both arched and flanked by stone benches, suitable for the visit of pilgrims; above the front door a tiny circular oculus opens at the same level of the bell tower that hosts a small cross made of volcanic rock. The left side of the church is supported by five buttresses, on the right side we find two chapels, dedicated respectively to St. Ursula and the Madonna of Divino Amore. They were renovated in the 70s and enriched with the laying of a large altarpiece embossed copper realized by Totorino Spanu, a local craftsman. In the past, the festival of the church was celebrated on May 2, while another holiday, the most solemn and preceded by a novena, took place on Pentecost with a horse race. For some years the celebrations were part of the so-called "festas de pandela", taking place in other churches in the dorgalese countryside- Now the festival is celebrated on the Saturday before Pentecost, the procession starts at 6 pm from the parish church andended with the mass at Su babbu mannu church. The celebration ends with a refreshment offered by the organization that is in charge of musical entertainment. Su Babbu Mannu church is located 3.5 km from Dorgali, on the right side of the SS 125 just before the junction for Galtellì, at km 208.VIII. The area is shaded by old and imposing olive trees. Built in 1621 by Pietro and Maria Fronteddu Murgia, who granted the ownership to the chaplain. 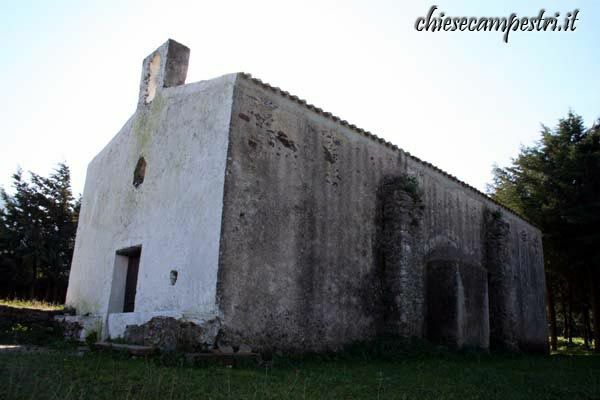 Through Respuestas 1778, communicated by the then parish priest of Dorgali to the vicar general of the Diocesi of Galtellì, we learn that this church was in good condition and, like the other rural, it was guarded by a Eremitano. In 1781 there was a dowry of 240 crowns, while the party had secured 93 shields for the maintenance of the courtyard and the building. Completely white daubbed, it has a gabled roof, on which stands a squat bell tower with a small bell; above the entrance stands a rounded window, the only light for the the nave divided into three bays, to which is added the presbytery. The body that serves as a vestry is built onto the left and possesses a rectangular window. The five side chapels,created in the past by devoted families, are dedicated to S. Atanasio, S. Barbara, S. Caterina da Siena, San Quirico and Santa Margherita, represented by wood statues. All around the church are the ancient cumbessias now crumbling: it is easy to imagine that once were populated by revelers resided here during the novenas. The celebration of the church was in the past on the last Sunday of May and the third Sunday in October; both solemnity was preceded by a novena. The Culture of the Municipality of Dorgali, in collaboration with the parish and with voluntary organizations, has restored the ancient celebrations making them part of the so-called "festas de pandela". The last Saturday of May, in the afternoon, the procession starts from the parish church and arrives at the church to attend the mass. Refreshments accompanied by traditional music follow. The church is located less than 8 km from Dorgali, on the road leading to the Gorropu, Tiscali and Oddene. On the way, a short distance from the village, you can visit the ruins of the church of Sant'Elena too. The church was built where, according to legend, the saint builded her modest home. Santa Caterina di Alessandria, was called the philosopher for her arguments against the doctors of Egypt's thesis on Christianity. The pagan emperor Massimino wanted to marry her but Caterina declared herself bride of Christ, and rather than submit to the pagan doctrine, faced martyrdom. Caterina should have been crushed by a wheel, but a miracle happened and the instrument of martyrdom broke right before touching her body. So Caterina was beheaded in 746. Santa Caterina was nominated patron of Dorgali in 1600. The title was given because devoted believed that the saint saved the country from a terrible drought, providing a miraculous rain. The church was built in 1737, the altars were made of stone, like the floors and steps leading to the altars. At the beginning of 1800 these were replaced with marble altars, floors and stairs. Even the old organ with reeds painted, which represented the story of the saint,was replaced. The town has given a lot to this church and spent a lot of money for its restoration. The fresco on the apse was realized by the local artist Pietro Mele and represents the martyrdom of Santa Caterina. The church is located on the hill overlooking Dorgali and is dedicated to Nostra Signora del Carmelo, which is celebrated on July 16th . The church was built as ex voto, following the liberation from invasion or plague. It was restored in 1974, with popular donations I's a quiet place of worship, surrounded by a garden with a beautiful view. The church has the typical local structure: on the main altar is placed the terracotta statue of the Madonna del Carmelo, on which they were made restoration. It was also built a second altar in front of the original so that now the celebrant is always facing the congregation. As soon as you walk through the entrance on the right, there is a chapel dedicated to San Francesco, with a terracotta statue of the saint, recently restored. Looking from the altar to the entrance you can enjoy a wonderful view of the village. Religious services are held only during the celebrations, attended by a small number of devoted. It is a small church with a rectangular apse raised by two marble steps and no banister. Dedicated to Nostra Signora di Bonaria, it was rebuilt in its current location in the 1960s. Previously the church stood a little further upstream with the front wall facing east. With subsequent urban reorganizations the original church was unfortunately demolished in favor of the new, wider and more suitable to contain the faithful who arrived during the summer when the town is mostly populated. Currently the church is very active both in winter and in summer hosting events and charity foundraising.